We have highly acknowledged organization engaged in presenting a remarkable range of Crystal Healing Stick. We are amongst the reputed organizations, highly engaged in manufacturing an optimum quality range of Healing Stick. We are credible manufacturer and exporter of Beaded Wands & magical wands. A Beaded Wands & magical wands sparks the imagination of every youngsters. Our kit includes material for making eight 12" magical wands, including, wire, colorful beads, pearls etc. 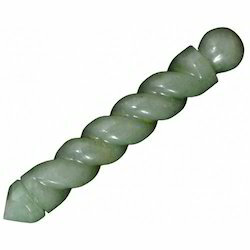 Green Aventurine Wands - These Green Aventurine Wands are cut and polished. 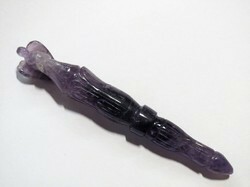 These wands are great for meditation and for energy sessions and body work. Bottom End : Clear Crystal Quartz Six faced Pencil Point. Driven by vision to achieve significant growth in the industry, we are engaged in manufacturing a wide range of Rosewood Wand. - we are the manufacturer and exporter of ancient and powerful words of beaded healing sticks that magnifies the force of healing. We have sun stone healing massage sticks of different sizes and weight. Every crisis humankind confronts--teaches us that healing in the face of life’s challenges is not a luxury but a necessity.